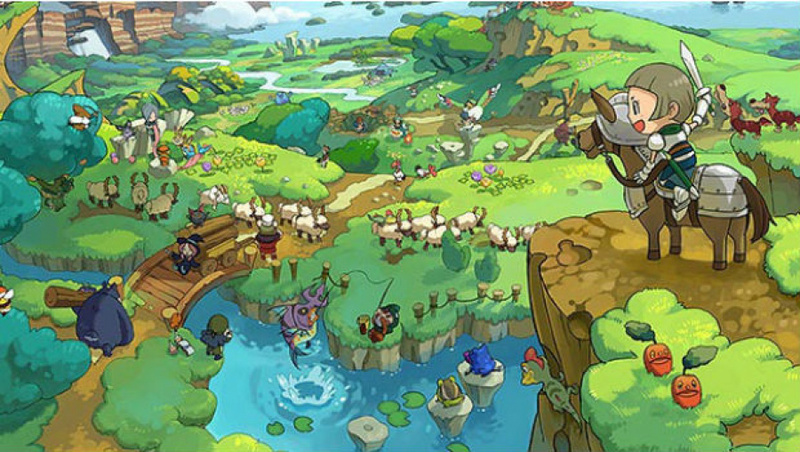 Level-5's Fantasy Life, which was developed along with Nintendo subsidiary 1-Up Studios — formerly Brownie Brown — has performed well in Japan, so much so that the publisher has announced a new upgraded version of the title, called Fantasy Life Link!. As an RPG that allows you to choose a career, set off on a quest and also mess around a lot, the goal with the expansion is clearly to tap into social aspects of the experience. The expansion will allow four players — who are on each other's friend lists — to play together in the main game, while a Link mode will mean friends can also exchange messages and track each other's progress. The Link idea will also be followed up with a related website, while extra content will arrive in the form of a new island, with additional items and monsters included. The new content will be available in two ways. A newly branded version of the game, with the full title and additional content, will arrive for 4,980 Yen, while those that have already taken the plunge can download the updated features onto their copy for 2,000 Yen; both arrive on 25th July in Japan. With trademarks recently spotted for Fantasy Life in both North America and Europe, we're optimistic that the title will eventually make it outside of Japan. It seems likely that the expanded version would be released, but we'll just need to wait and see. Oh boy, I really want this game. This games seems pretty interesting to me and an expansion pack is always welcome, especially if it comes to the west. They need give us a release here in NA.. these type of games always have my attention. It'd be a day 1 buy for me. This sounds fantastic and I hope more developers do stuff like this. Preferably in more interesting games. I hope the expansion is included if it launches in the U.S. I'm really holding out for a Western release of Fantasy Life! Looks like such a sweet game. I know it will come over here. I just hope it does it this year. Looks really fun and varied. Looking forward to this. It looks like it's going to take up a lot of time. I really like the sound of this game. It really should come to USA, the EU and the rest. Want AXNL first, though. I mean, Level-5, localize your awesome games already! We want Inazuma Eleven, Youkai Watch, Cardboard Senki, Fantasy Life, Professor Layton vs. Ace Attorney!!! COME ON!!! A number of 3DS games have been localized I was wishing for have been. There are still so many more I'm hoping for, this near the top. Groovy. I love the way 3DS games are upgradable just like that. This looks really awesome. I would love to see it in North America. Ever since I saw the trailer for this game back in 2011 I just had to have it! Since the trademark has appeared, I am eagerly waiting for an announcement of a localisation of this. The waiting game...I hate it. Could be the reason why for the international delay. I'm hoping this is announced at E3. ... Is this like Animal Crossing with a purpose? Is this the new animal crossing? @Marakuto Your avi is my reaction to waiting for this game to come. Actually DQ9 when it was in the making looked A LOT like this game as far as the battle system,. Also did they specify if it would be online Wi-Fi or just local? This looks so AWESOME!!!! It's such a beautiful looking game and the art style is adorable, even to a 21 year old male gamer, all I can say is wow! just wow! I hope they announce either version of this game in the Nintendo Directs.